I was 7 years old with a new pair of red rubber rain boots. They were so awesome I insisted on wearing them every day to school, rain or shine. The rain would mean I’d get to jump into puddles with them; the sunshine I discovered just made the cherry-red colour shinier. Sitting outside in one our outdoor class sessions one day, I remember Mrs. Wulf my first grade teacher telling us about the concepts of energy. Then she continued by telling us to remove our shoes and stand bare feet on the grass. I obediently took off my red rubber boots and let the grass tickle my bare feet. It was years later that I fully understood the concept and benefits of the earth’s positive ions and the character of certain materials being isolators or conductors. But at that moment I was horrified at the slander of my beloved red rubber boots. How can something so beautiful and shiny be an exhibit for something negative? Then followed the insistent phase of a little girl being barefoot, but that’s another story. Mrs. Wulf was on point though, we humans are master inventors but most of our man-made contraptions and gizmos only isolate us further from the pulsing, vibrant, beautiful thing called the living environment. And what about lifestyle? That intangible human invention almost in equation to concrete dreams, electricity high, and consumption addiction? We just get sucked in. Don’t get me wrong, I have nothing against technology and development it has helped to solve many problems and increased our quality of life, right? We can’t go back to being cavemen but I can’t help thinking we’ve gone way too far from a balanced co-existence with the planet. Quality of life and cultural advancement should not simply be equated to shiny new technologies and economic growth. Let’s break down nature’s way of living and compare it to our modern slash industrial existence. In nature there is no waste, every by-product of a natural system is a supplement for another, our society on the other hand generates enormous amount of waste –and we don’t even know what to do with it. We live in standardized reality where everything is mass produced – today around the world people watch the same TV shows, buy the same products, and have the same consumer ideals of what they call ‘the good life.’ Nature on the other hand is in a torrid love affair with diversity and uniqueness: no two leaves or snowflakes are the same, every zebra and leopard has different marking patterns, even the most identical of twins have different characters. And what about social well being? Nature relies on working relationships for its sustainability, the bee helps to pollinate the flowers, the worms help fertilize soil; the trees produce oxygen and provide housing for other critters (right about now, The Lion King soundtrack would be blaring ‘it’s the circle of life…’). Forget the circle of life; we on the other hand are advancing on a linear path to achieve maximum income, higher GDP’s and material wealth, all at the expenses of the planet and our own sanity. Modernity has proven though that we are highly intellectual beings, capable of shaping and designing our own reality. It takes that highly intellectual being to step back, analyze the distortions, and make the necessary changes to regain that balance. Everything we consume, buy, eat, drink, wear, ride reflects our relationship with the planet. The money in our pockets is actually a voting tool. As consumers, we have a great deal of power by supporting the ethical companies and products and withdrawing our support from the ‘bad’ ones. Awareness of global poverty, animal welfare and green issues are at an all time high. If we can carry this awareness into our shopping behaviour, we can all work together to make sure that companies start treating, it and us, with more respect. While money may make the world go round, deciding how we spend our money might just save it from a rapid meltdown. Environmentalists may shout out demands of change, and a revolutionary change is exactly what the world needs right now. But change cannot be achieved if it isn’t based on the most fundamental and logical reasons: Love. It is love, appreciation, and respect towards the living environment that is missing from most of us today. Not surprising, as development systematically pushes aside every natural element and experience out of our daily realities, nature sadly has become regarded only as an input to the economic system, its existence quantified and measured to be exploited for our needs. 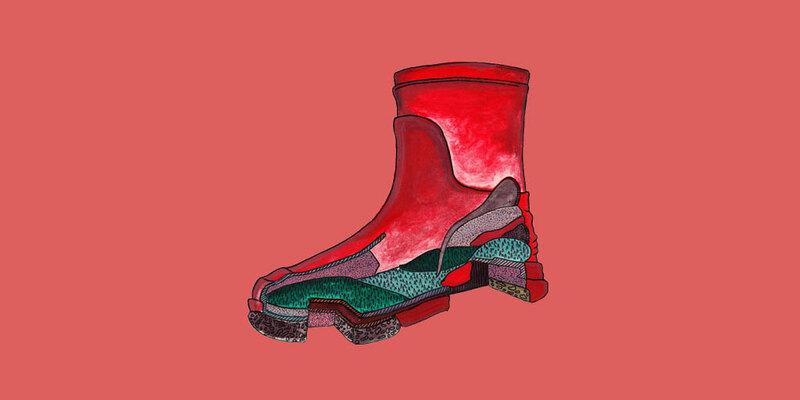 We all own a pair of red rubber rain boots in the daily instruments and luxuries we surround ourselves with. We all adore and marvel at the ability of these boots to provide comfort in our daily lives, both functionally and visually. But these rubber boots have slowly disconnected us from the spiritual and physical bond we share with the earth. The grass and earth feels foreign to our bare feet and we are no longer confident in walking bare sole to stone. When you find yourself next confronted with a patch of grass, an open field or a stream of water, don’t look for ways to walk around it. Feel the freedom in kicking off your ‘red rubber boots’ to take time to reconnect. Go on a nature trek or an open door adventure, take time to recharge and rebuild that relationship you have with Mother Nature. Take time to allow your senses to fall in love again or maybe for the first time. In the robotic reality we have allowed ourselves to be trapped in, feeling human again in our most natural setting is really what sets us free. Once you are again in that love affair with earth, you will find it’s the most natural thing to protect it. Your behaviour and your decisions will mimic that deep affection you let yourself feel again.